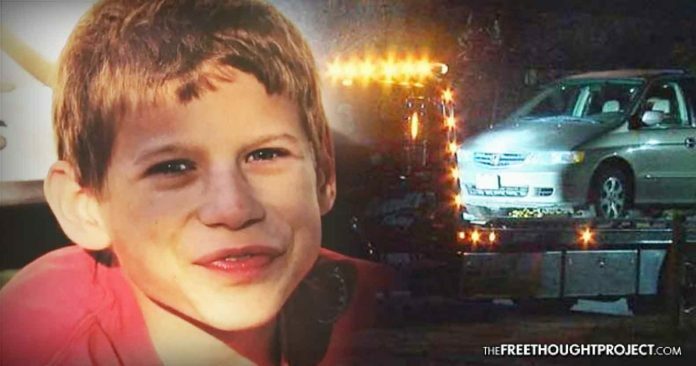 A young boy was trapped in the back of his family's minivan and called police—twice—begging for help, however, his calls to 911 were written off as a prank and he died of asphyxiation. Cincinnati, OH — A tragic case of police incompetence unfolded this week which led to the death of a young boy who desperately needed police help, calling 911 multiple times, but died as they ignored his pleas. Kyle Plush, a 16-year-old high school sophomore suffered a tragic fate this week as he was crushed to death in the back of his family’s minivan. Somehow, Kyle had gotten trapped under the third row seat while the car was parked in the school parking lot and he was unable to free himself. According to police, they say that in the call recording, the dispatcher can be heard asking Kyle for his location several times but it was unclear if he heard the operators questions. As FOX reports, Cincinnati police and a Hamilton County deputy sheriff responded to the area but couldn’t locate Plush. The dispatcher attempted to call Plush’s phone but there was no answer. According to Isaac, the dispatcher who took the second call has been placed on administrative leave pending the outcome of the investigation. Police are also looking into how, exactly, the teen became trapped in the first place. Why the boy didn’t call a family member also remains unclear. However, had he done so, rest assured that it would not have been perceived as a prank.